DETROIT -- General Motors Co. is doubling the size of its battery lab ahead of the U.S. debut of the Chevrolet Volt plug-in hybrid late this year. The lab, in GM's Technical Center in Warren, Michigan, will expand to 63,000 square feet from 30,000, GM said in a statement. The increase will create more space for developing chargers, building batteries for trials and running tests. Construction of the new space starts this month and will end this summer. 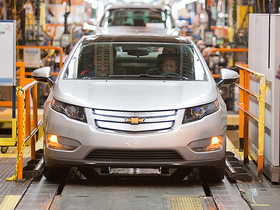 The lab opened in January 2009, part of GM's commitment to building batteries for the Volt in a plant south of Detroit. The batteries use lithium ion cells from South Korean supplier LG Chem.